Today we celebrate yoga, the great form of mind/body discipline that originated in India about 5000 years ago. Then as recently as 2015 the current Prime Minister of India, Narendra Modi, proposed to the United Nations that a World Yoga day should be created. And so it was. June 21st. Today is World Yoga Day. Yoga mainly consists of postures or asanas that are designed to increase your strength and flexibility and it has a particular usefulness for proper breathing, all of which are key components of healthy living for both mind and body. An interesting aspect of Yoga as taught in India today is that we, the students, are never asked to push ourselves hugely beyond what is comfortable. This is at odds with gym lovers in the west who seem to take competition with them even to the ‘leisure’ centre! Yoga, now commonplace in the western world, has been re-shaped in some situations to appeal to a different temperament with different lifestyle and health goals. But no matter what shape in which it is presented it has been proven to have verifiable benefits. Regular pracice undeniably helps you to get in tune with your body and to strengthen your core. And now, a new study has revealed that yoga can also help us exercise our mind. According to scientists at the University of California a weekly routine of yoga combined with meditation can fend off cognitive decline associated with the ageing process. Whatever your goal come to Raheem Residency and learn from our very own Yoga Master. You will be in expert hands. Coming up in Kerala in September is one of the biggest events in our year. It’s Onam, a harvest festival, and it’s celebrated all over the state regardless of caste & creed during the month of Chingam (first month of the year in the Malayalam calendar). In Raheem Residency, we also celebrate Onam. The staff make the flower carpet & also a great feast is prepared with a variety of vegetarian dishes & payasam also. All the staff sit together, and enjoy the feast. We include guests too in Chagara Restaurant but there is one golden rule: guests must eat like we do – that is, with no cutlery! We believe that the food tastes better when we quietly use our fingers. Our guests always enjoy the challenge. So come visit us for Onam. Make your booking now! In the meantime, expect lots more photos to show you how we celebrate this festival! See more on our Facebook page too: Raheem Residency – Heritage Hotel. Laid-back Kerala indeed! Well, that’s how holidays should be. But we often notice in Raheem Residency that hard-working guests often bring their age-old patterns of living with them. Rushing there, arriving early, clock-watching. You know it. You’ve done it. You don’t actually see a Keralan (Malayalee) rush. You don’t see one run. And these aficionados of an easy-going life-style never panic. Is there something worth copying here? There certainly is when it comes to holidaying. It has been difficult to explain to local staff that if a guest books, say, an Ayurvedic massage for 2pm, then the therapist should be at her station by 1.45. Why? Well, it’s not just to prepare. It’s because invariably the western guest will NOT arrive on time. He/she will arrive early. A concept that nobody in laid-back Kerala can fathom! A group of British tourists came to stay. At dinner it was decided that they would all go to the beach the next morning at ten o’clock. The owner got wind of it. Now the beach was literally across the road from the hotel. No transportation required. And so like clockwork on the dot of ten the next morning the entire group traipsed out of the hotel. Nobody was ‘late’. They took it as the great sports that they were. But it’s worth another thought. You pay all that money to relax – mind, body and soul. Then you superimpose clock-watching on top of the goal. To kick-start the new truly-relaxed you, do a course in Ayurveda at your hotel. And book Shirodhara in particular (3 consecutive treatments give the best result). That specific treatment is for the mind that continually races, shooting backwards to ‘If only I had done…’, shooting forwards to ‘I must remember to do that’. And in the process the mellifluous birdsong and the scent of roses of the moment are but a puff of smoke that nobody notices. Is that you? If so, come to laid-back Kerala for the best laid-back holiday in India. Like all hotels, Raheem Residency too has to deal with an awkward email now and again. And no doubt it happens to you also even if you’re not in the tourism business. So here’s a tip. 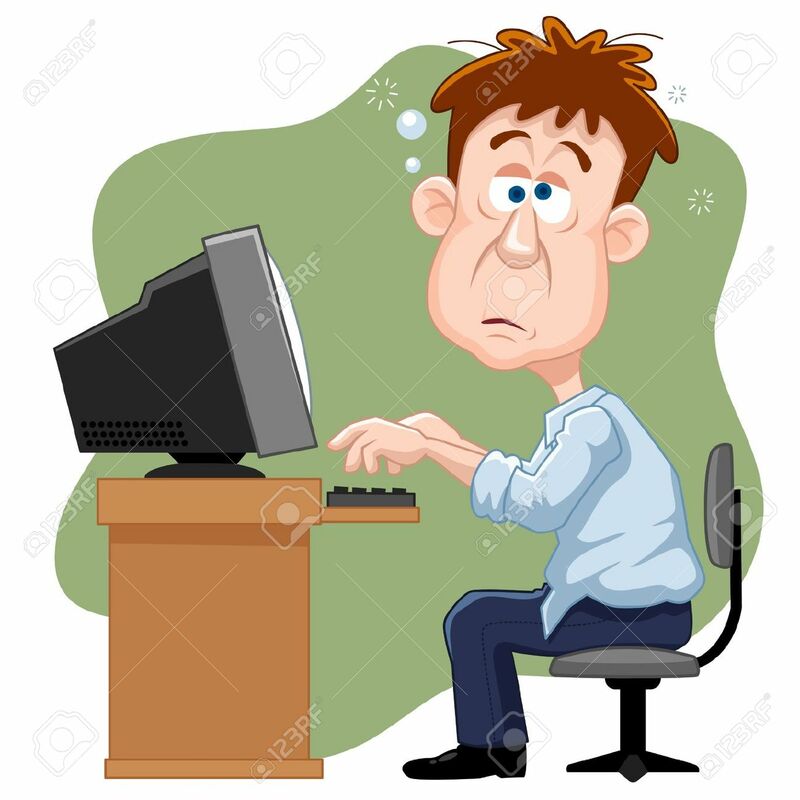 According to emaillabs.com there’s a premium time in the day when your tough email will get the best possible response. That’s after lunch around 1.30pm. Because the recipient will be done with the morning rush so you won’t be getting in the way. Secondly, his/her little belly will be comfortably full and the humour may be better! It all sounds so obvious. But then sometimes we need to be reminded of the obvious. Do we not? That same company maintains that women get more stressed out from sending that difficult email than men. But we all know some men who would say that women get more stressed over everything than men. Bah! But not in India. It’s one of the many striking differences between east and west. South Indian folk and people from Kerala in particular are more laid-back, easy-going and absolutely allergic to panic and rush. No wonder Ayurveda and Yoga originated here. Come see it at first hand! Book that holiday now! Relaxing Ayurveda Massage 4 u? Re-posting from October 27, 2014. So a guest arrived for a first visit to India. 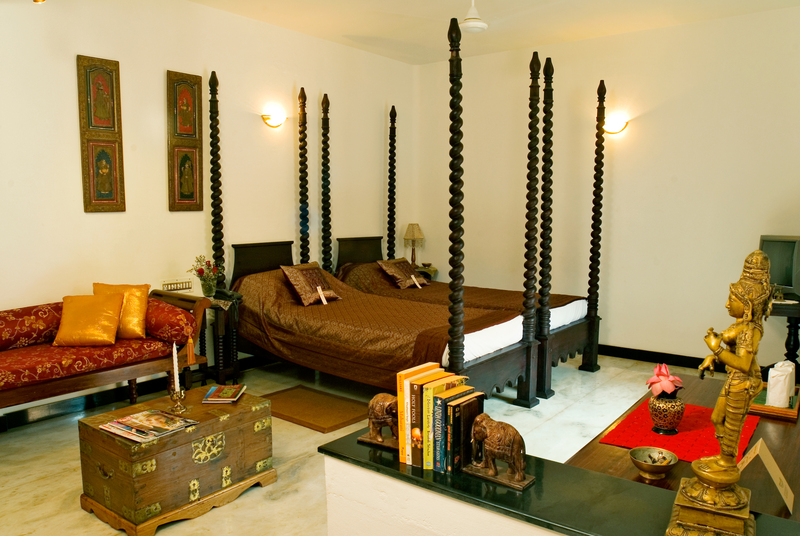 We are fortunate in Raheem Residency that guests often choose us as a first-stop on their Indian odyssey. We think it’s because we are small, intimate but not intrusive, and with western-eastern owners we feel (and hope) that we are sensitive to both cultures. Anyway Susan (not her real name) was tired from her three-flight trip and in truth more than a bit overwhelmed by the enormity and intensity of everything in India from people to rickshaws to colours and even smells. So we did the usual RR ‘treatment’. Suggested a relaxing Ayurvedic massage to chill out the mind and body, got a cleansing fresh cucumber soda from the kitchen, and sat under a coconut tree for a chat. Susan asked what was there to love about Kerala. I think at this stage she was wondering if she’d made the right holiday choice. But tiredness can make the mind go whacky, can it not? Anyway, in case you are wondering too here’s a short list of just 5. 1. The People. It has to be number one. So full of gentleness, kindness and patience. (No, we don’t include the crooks in that but guests are unlikely to meet them anyway). 2. The Food. Not like Indian food in the west. Fresh food, very local ingredients indeed, south Indian recipes (most western Indian menus are north Indian) that include a lot of delicate coconut milk and sometimes a few fireballs of spices! 3. The Sun. Can’t get away from it. Even in the rainy season it puts on a shining face most days. 4. The Scenery. 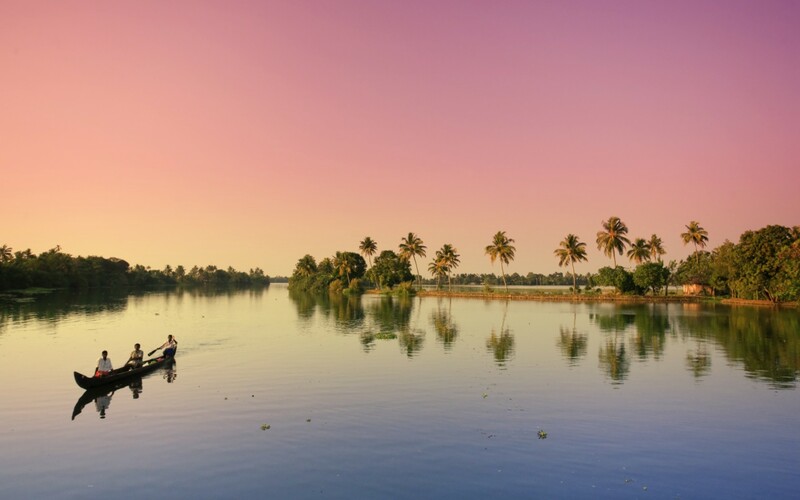 First stop has to be the amalgam of rivers, canals and lakes known as the Backwaters. Cruise at leisure in your private houseboat and drink in the stillness and serenity. Then hike up by taxi to the tea and spice plantations in the hill stations. Take in a beach as well. 5. Ayurveda. Top-class massage to relax and rejuvenate body and mind. And at a fraction of the cost in the west (how about a Facial for a tenner?!). Susan was visibly relaxing. The worried look in her face had been replaced with a tired but genuine smile. With that she took off in the direction of the Ayurvedic Suite. When she emerged, slathered in natural oils, she looked like her worries had faded and somehow you knew she would sleep like a baby that night. This entry was first posted in on July 1, 2014. There’s a common myth that if you travel in India you’re going to be confined to bathrooms along your route. In my 14 years there I’ve been stricken once only. And that was in a 4* hotel in Delhi which came highly recommended. I was careful about what I ate so I can’t put it down to the food. I suspect that it involved a lazy Housekeeper who filled the water jug in the room from the tap rather than with filtered water. I arrived late and tired. I was too lazy to ring for bottled water and put up with all the form signing etc so I took a chance. Bad mistake. I lost two days of my travel time due to solitary confinement. In Raheem Residency, we bring twice-filtered water to your room in a jug at check-in time. We don’t bring it to you in sealed bottles because we are furiously anti-plastic. But we stand over what we bring you. Tip No.1: Always check the source of the water in your room if it’s not in a sealed bottle. In our eleven years of operations in Raheem Residency we had one case only of Delhi Belly. I couldn’t understand it. Our track record was nothing short of excellent. So I did a bit of investigation. The previous night I’d eaten the same dish as the guest. And I had no after-effects. Then I poked around a bit more. He had eaten a meal from somewhere else in the meantime. And there are lots of excellent alternatives around us in Alleppey. But you need to know where to go. He didn’t. He also lost two days of his holiday. Tip No.2: Choose carefully if you eat in venues that are further down the money scale. For example the top street vendors – the Indian equivalent of the American hot-dog stand – can produce the best snacks. That’s because these treats eg samosas, bhajis etc are cooked in fat at high temperatures thus killing off any potential harmful bacteria in the process. The immediate environment can definitely be shabby so keep one eye closed! On the other hand, buffets in hotels are hugely popular. There’s a great variety of dishes and for those who like the principal of ‘Eat as much as you like’ this eating experience is almost like a dream come true. But I’ve never had a buffet – even at 5* level – that is steaming hot. So I become suspicious. 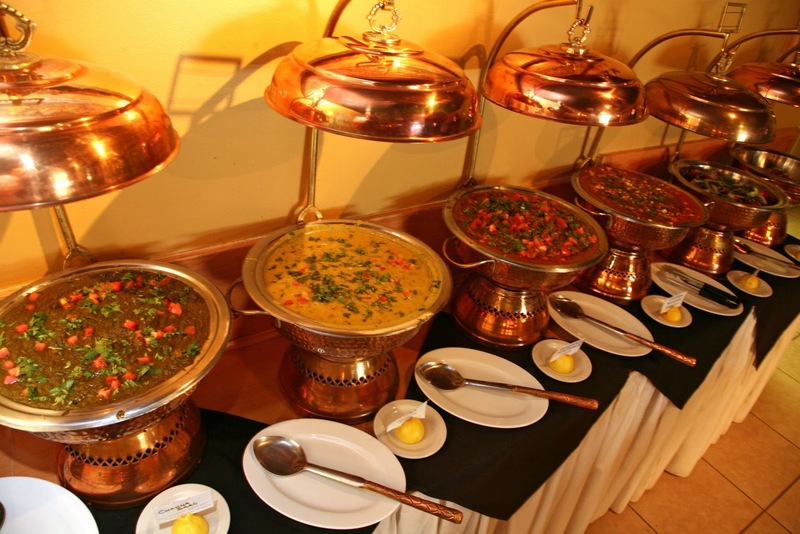 Tip No.3: Be prepared for lukewarm buffets. Common sense rules should prevail. Wash raw fruit and vegetables thoroughly if you’re going to munch on them. Avoid salad leaves that may have been washed under the tap. It’s not too difficult. A good salad is hard to find. And for the cure, make sure you have packed your digestive ‘cement’ and stay well-hydrated – include some electrolytes which you can find in any pharmacy. But let’s not hammer our beloved India especially for this curse.I ndia has no such exclusivity. The same undesirable condition also comes with the monikers Montezuma’s revenge (S America), traveller’s trots (universal?) and ugh! so much more.